People have been eating carrots for some 5,000 years, reportedly starting in the Middle East and Afghanistan. These early carrots were purple and yellow. Our familiar orange carrot was probably developed in the 1600s in Holland. 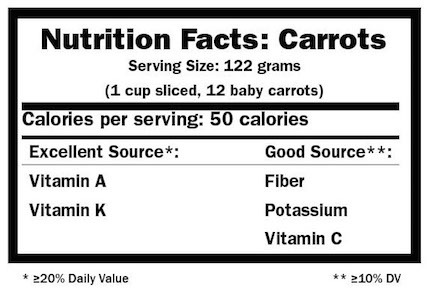 Today, carrots are among the most popular vegetables in the US. The bagged baby carrots helped spur their popularity when they were developed in the 1980s. (These aren't young carrots - they come from larger ones cut to the smaller size.) You can also find carrots in purples, reds and yellows, each with their own unique mix of phytochemicals. Luteolin, a flavonoid phytochemical that shows antioxidant, anti-inflammatory and anti-cancer effects in laboratory studies, anti-cancer effects. Purple carrots contain anthocyanins, which are flavonoids; red carrots are a source of lycopene, and yellow carrots contain lutein, both carotenoids. Carrots’ cancer fighting potential comes from being a non-starchy vegetable as well as a source of carotenoids and other phytochemicals. Beta-carotene is the carotenoid that has received the most attention, but research into carrot’s other compounds and carrots as a whole are underway. In addition to their roles as antioxidants, beta-carotene and alpha-carotene promote cell-to-cell communication, which seems important in maintaining normal control of cell growth. Luteolin and falcarinol, also found in carrots, decrease cancer cell growth and increase cancer cell death in cell and animal studies. Population studies link foods rich in total carotenoids with lower risk of lung cancer. Larger studies now show protection less clearly than earlier studies; additional research is needed. Several population studies link higher dietary carotenoids, and especially higher blood levels of carotenoids, with lower risk of some types of breast cancer. Because higher blood levels of carotenoids indicate higher vegetable and fruit consumption, these other plant foods and their healthful compounds may play a role. Limited population studies tentatively link higher amounts of beta-carotene and alpha-carotene in people's diet and especially their blood levels with modestly lower risk of breast, along with several other cancers. However, beta-carotene in high-dose supplements, especially in smokers, seems to increase lung cancer risk and mortality. Further research is underway in all these areas. Looking beyond carotenoids, limited population studies of carrots specifically link them with potentially lower risk of lung, cervical, and prostate cancers. Choose smooth, firm carrots. Some carrots may have cracks as a result of growing or storage conditions. Make sure to wash all your carrots thoroughly and cut out the damaged areas. Green tops, if attached, should be feathery and not wilted. Deeper orange color indicates higher beta-carotene content; purple carrots indicate anythocyanins. Carrots keep longer than many other vegetables. Use within two weeks for best flavor, but if refrigerated in plastic they’ll keep longer. Store carrots away from fruits like apples and pears, which give off ethylene gas that affects flavor and storage time. Carrots with their green tops on will keep better if you cut or twist off the leaves. Cooking brings out their natural sweetness and heat does not destroy their alpha- and beta-carotene. For better absorption of these carotenoids, chop, grate, purée or heat the carrots and eat with a small amount of fat. As little as three-fourths of a teaspoon of fat is enough to help, whether it’s added to carrots or in other foods. Add chopped or grated carrots to vegetable and pasta salads, plus stews and casseroles. Stir grated or matchstick-cut carrots into muffin batter, spaghetti sauce and soups. In large skillet, heat oil over medium-high heat. Add carrots. Sauté until carrots become tender crisp and start to brown slightly, about 11-12 minutes. Reduce heat to medium. Sprinkle vinegar and sugar over carrots, stirring to thoroughly coat carrots. Season to taste with salt and pepper. Remove from heat and serve warm. 1. Song, W., et al., Cellular antioxidant activity of common vegetables. Journal of agricultural and food chemistry, 2010. 58(11): p. 6621-9. 2. U.S. Department of Agriculture, A.R.S., Oxygen Radical Absorbance Capacity (ORAC) of Selected Foods, Release 2. 2010. 3. World Cancer Research Fund / American Institute for Cancer Research, Food, Nutrition, Physical Activity and the Prevention of Cancer: a Global Perspective, 2007: Washington, DC. p. 82-113. 4. Seelinger, G., et al., Anti-carcinogenic effects of the flavonoid luteolin. Molecules, 2008. 13(10): p. 2628-51. 5. Lin, Y., et al., Luteolin, a flavonoid with potential for cancer prevention and therapy. Current cancer drug targets, 2008. 8(7): p. 634-46. 6. Purup, S., E. Larsen, and L.P. Christensen, Differential effects of falcarinol and related aliphatic C(17)-polyacetylenes on intestinal cell proliferation. Journal of agricultural and food chemistry, 2009. 57(18): p. 8290-6. 7. Christensen, L.P. and K. Brandt, Bioactive polyacetylenes in food plants of the Apiaceae family: occurrence, bioactivity and analysis. Journal of pharmaceutical and biomedical analysis, 2006. 41(3): p. 683-93. 8. Christensen, L.P., Aliphatic C(17)-polyacetylenes of the falcarinol type as potential health promoting compounds in food plants of the Apiaceae family. Recent patents on food, nutrition & agriculture, 2011. 3(1): p. 64-77. 9. Kubo, A., et al., Dietary factors and the risks of oesophageal adenocarcinoma and Barrett's oesophagus. Nutrition research reviews, 2010. 23(2): p. 230-46. 10. Gallicchio, L., et al., Carotenoids and the risk of developing lung cancer: a systematic review. The American journal of clinical nutrition, 2008. 88(2): p. 372-83. 11. Musa-Veloso, K., et al., Influence of observational study design on the interpretation of cancer risk reduction by carotenoids. Nutrition reviews, 2009. 67(9): p. 527-45. 12. van Het Hof, K.H., et al., Dietary factors that affect the bioavailability of carotenoids. The Journal of nutrition, 2000. 130(3): p. 503-6. 14. Kim, M.J., et al., Luteolin induces apoptotic cell death through AIF nuclear translocation mediated by activation of ERK and p38 in human breast cancer cell lines. Cell Biology International, 2012 . 36(4): p. 339-44. 15. Wu, B., et al., Anti-proliferative and chemosensitizing effects of luteolin on human gastric cancer AGS cell line. Molecular and Cellular Biochemistry, 2008. 313(1-2): p. 125-32. 16. Leoncini, E., et al., Carotenoid Intake from Natural Sources and Head and Neck Cancer: A Systematic Review and Meta-analysis of Epidemiological Studies. Cancer Epidemiology Biomarkers and Prevention, 2015. 24(7):p. 1003-11.